As I may have told a lot of times before, I made the biggest financial decision of my life earlier this year, January 20 to be exact. It was an unforgettable moment for me because one, it was right after I resigned to my job. (I got the opening fee of 5000pesos from my savings in the previous job) and two, I had long been planning about doing it. Now after 9 months and counting (click: FAMI Update!!!) I have no regrets at all. The growth of my money in terms of my investments minus my current account status markup is now 3-digits. Truly, the peso-cost averaging method works for long term investors. Today I decided to create these things that I did consider before making a leap in my financial preference and I hope will help you too if you are thinking about investing or maybe in doubt. For any inquiries email me at izzaglinofull@gmail.com Also subscribe via RSS for free updates. 1. Set financial goals. Almost 60% of those who formulate a goal in life succeeds. This is because creating goals help stimulating focus thus you became thorough in reaching your wants in life. You may need to create a short-term and long-term goal. 2. Assess your investment risk tolerance. Define as to what degree are you able to withstand or be unaffected even if the stock market is shaky most of the time. An individual should have an understanding of his or her ability to mood swings in the value of his or her investments as well as its returns. 3. Be informed on the variables in line with your big financial decision. Examples of these will be your time horizon, you investment vehicle and your liquidity needs. 4. Know how your default asset allocation will be. For example a typical FAMI-Save and Learn Equity Fund will make have the asset allocation portfolio like the photo below. *Now this thing is for those who will choose a mutual fund, for direct investment on the stock market you may opt to research as to where will you buy and sell the stocks that you own. 5. Take note of the risks and return. If you choose to invest in FAMI, you need to invest for not less than 1000pesos top up. Also when you redeem before 6 months of your investment, FAMI will have a percentage fee. 6. Have some expert advice. Do communicate with your financial advisor or if you don’t have one then you may want to ask others who had experience already in investing. He/she can help you big time on what to do. 7. What your investment method? Research how you would want to invest. Are you going to top up monthly or weekly? Are you using the peso-cost averaging method? 8. Study your portfolio performance. Take note how many shares you own, what percentage are spent on what categories. These can be your metrics on whether you are doing good in your financial decision or not. 9. Take Action if problems arise. If your investments are slowly deteriorating then it may be the right time to reexamine the problem and take action. Do not let your hard earned money slip away. 10. Commit to your decision. I believe there’s no right or wrong decision as long as one is committed enough. For example, when I opened my FAMI account I don’t have any emergency fund and was just dependent to the upcoming events to live.But through commitment and discipline I was able to survive adding funds to my investments. You need to sustain the momentum of your financial decision. 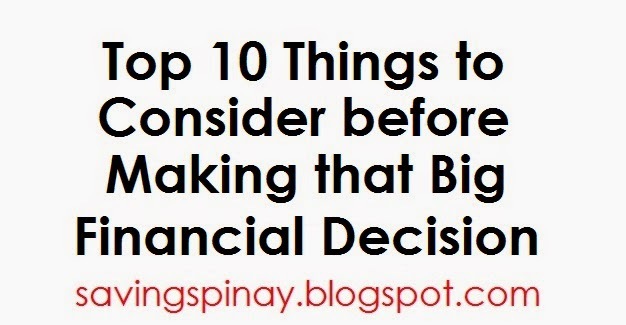 The Top 10 Things to Consider before Making that Big Financial Decision above had helped me big time in my investing journey. It’s true now that I have maintained one portfolio I just want to add and add and add more!!! Hope this post inspired you!